Valedictorian. When the term comes up around high school graduation time, you think of an outstanding student whose excellence will present them with tons of options. That’s the position Sierra Butler was in as Jefferson High School’s 2014 valedictorian, but the option she found most appealing ultimately surprised plenty of people around here. Sierra turned down a number of scholarship offers from four-year schools to enroll at Sinclair. “I was accepted into a lot of universities and got scholarships to a lot of them, but they just didn’t feel right,” she says. But when her mentor suggested taking a look at Sinclair, she said that shortly after stepping on campus, she knew it was the place for her. Looking long-term, she also felt that it would be an ideal progression, allowing her to keep costs low while still ending up with the degree choices she was most interested in. Her choice surprised most of her peers, some of whom felt she wasn’t being nearly ambitious enough, not to mention she wasn’t going away from home to live in a dorm or have typical college fun like frat parties. Even her high school counselor wasn’t sure about Sierra’s choice, but she was. 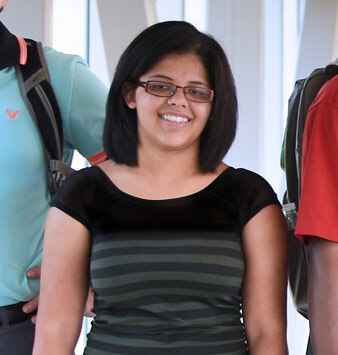 Sierra began classes this fall as a junior at Wright State, majoring in psychology. She’s continued her role as a high achiever, volunteering as a Transfer Ambassador, working on the Wright State phonathon and joining the Ohio STEM Ability Alliance. Her exposure to education both at Sinclair and now Wright State has her planning for a future career as a clinical/mental health counselor. Learn more about Sinclair's Psychology program and Transfer Services.